Global stocks have taken a beating this month, but a surprising market has actually bucked the overall negative trend: Brazil. Brazil’s Bovespa index is up more than 8 percent in October. The iShares MSCI Brazil ETF (EWZ) — which tracks Brazilian shares — has skyrocketed more than 18 percent this month, its best pace since March 2016. 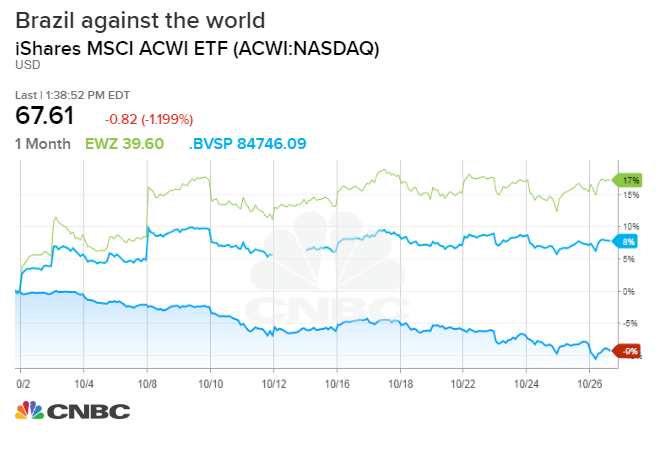 Meanwhile, the iShares MSCI ACWI ETF (ACWI) — which tracks stocks from around the world — has plummeted nearly 9 percent in October, its worst month since May 2012. The stark outperformance of Brazil’s stock market comes ahead of the second round of the country’s presidential election. Far-right candidate Jair Bolsonaro is largely expected to emerge victorious over leftist Fernando Haddad. Bolsonaro took a commanding lead in the first round of elections in early October, earning 46 percent of the votes — only 4 percent from winning the presidency outright. His opponent Fernando Haddad garnered just 29 percent. Since then, EWZ has surged more than 7 percent while Bovespa is up around 1.5 percent. The latest polls also show Bolsonaro has an easy path to victory in the second round. According to the latest survey this week by the Brazilian Institute of Public Opinion and Statistics (Ibope), Bolsonaro leads Haddad by more than 10 percentage points. “The equity market has spoken, and the equity market has told you that Bolsonaro is going to win this election,” said Daniel Osorio, president at Andean Capital Advisors. But Osorio and others cautioned the equity rally and increased confidence in Brazil are not reflective of faith in Bolsonaro, but rather relief that the PT, Haddad’s far-left Workers Party, will not once again take the reins of the world’s eighth largest economy. “The market is sick and tired of the PT party presiding over Brazil,” Osorio said. Haddad became the Workers Party candidate after a court banned former President Luiz Inacio Lula da Silva from running again. Da Silva, better known as Lula, is serving a 12-year sentence for corruption. Lula’s government — along with that of Dilma Rousseff, his successor — led to a ballooning fiscal deficit and contributed to an unsustainable pension system, which surged from 3 percent of GDP in 2013 to 8 percent of GDP last year. Those two leaders also presided over the country’s worst recession in its history. Unemployment has not yet recovered, still sitting at 12 percent as of September. Brazil’s economic troubles, coupled with increasing crime and a record murder rate in 2017, have made Bolsonaro more appealing to the Brazilian electorate. Investors have cheered Bolsonaro because of his economic platform — in particular advocating for greater central bank independence and privatizing state-run companies. Over the past few weeks of the campaign, Bolsonaro has also pledged to cut the public pension system and reduce the number of ministries to streamline government. Though in some cases he hasn’t offered specifics in his economic platform, many have also pointed to his choice of University of Chicago-trained economist Paulo Guedes as his chief financial adviser as evidence Bolsonaro could take up more investment-friendly policies. Haddad has attempted to counter the growing support by stressing that his opponent only promises temporary fixes to complex economic issues. He recently said the market preferred Bolsonaro only because it sees ‘quick gains’ in the privatization of state companies. Still, Brazilian stocks posted their best day in over a year after Bolsonaro’s first round victory on Oct. 7 and have marched higher ever since. Even more impressive, Brazilian equities’ strong run have come amid a recent downtrend for emerging markets overall given a sharp rise in the dollar. The greenback hit its highest levels since mid-August on Thursday. 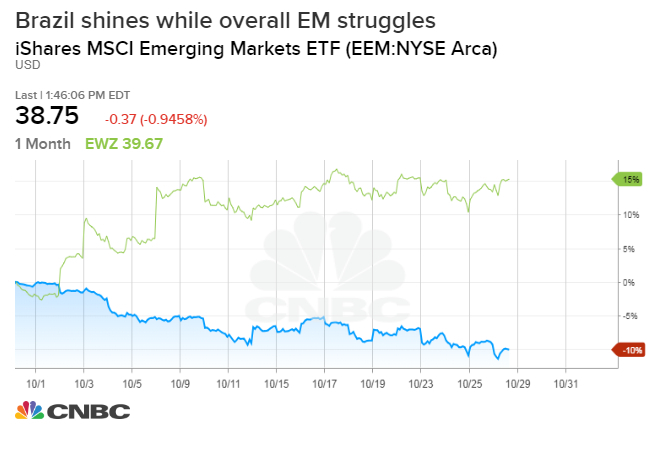 The iShares MSCI Emerging Markets ETF (EEM) — which tracks emerging market economies — hit an 18-month low amid a broader market sell-off. The index is down more than 20 percent from its recent highs in late January, a level some traders consider bear market territory. But, while Bolsonaro has gained investor confidence heading into Sunday’s decisive election, analysts caution the rally could be short-lived following the election. Bolsonaro, a candidate who has been criticized for making racist and homophobic comments, could lack the political capital necessary to tackle economic reforms. Others have pointed to his track record in Congress — in which he advocated raising public sector pay and pushed back against privatizing state-owned entities — as indicative of an unpredictable leadership style that could frustrate policymakers and investors alike. Win Thin, global head of emerging market currency strategy at Brown Brothers Harriman, said the recent run-up in Brazilian equities could be “overdone,” citing the widespread under-performance in emerging markets. And, despite rallying in recent weeks on the hopes of Bolsonaro’s victory, the Brazilian real has still fallen more than 10 percent against the dollar this year. Meanwhile, other analysts have pointed to earlier elections in emerging economies as a good test case, including Argentina in 2015 and India in 2014. In both cases, pro-business candidates inspired double-digit stock market rallies — only to fade over the next 12 to 18 months.